Although the ocelot is included in my category of endangered big cats, they fall into a sub-species of smaller "big cats." A full grown male ocelot may weigh 24 to 35 pounds, with the females slightly smaller, and its body length may be up to five feet. The ocelot has magnificent rosette markings, very similar in color and appearance to that of the leopard. Large white circles on the backs of both ears. The tail is one-third the length of its body. In the U.S., the ocelot is still occasionally found in parts of Arizona, and in south Texas brush country and the lower Rio Grande Valley. To better blend with the brush habitat, these ocelots may be lighter in color than the jungle ocelots. In Mexico, Central America, and South America, they may be found in dry scrub and chaparral zones, to jungles and tropical rainforests. They much prefer marshes and riverbanks to open country, according to Zoo.org. Why Is the Ocelot an Endangered Species? 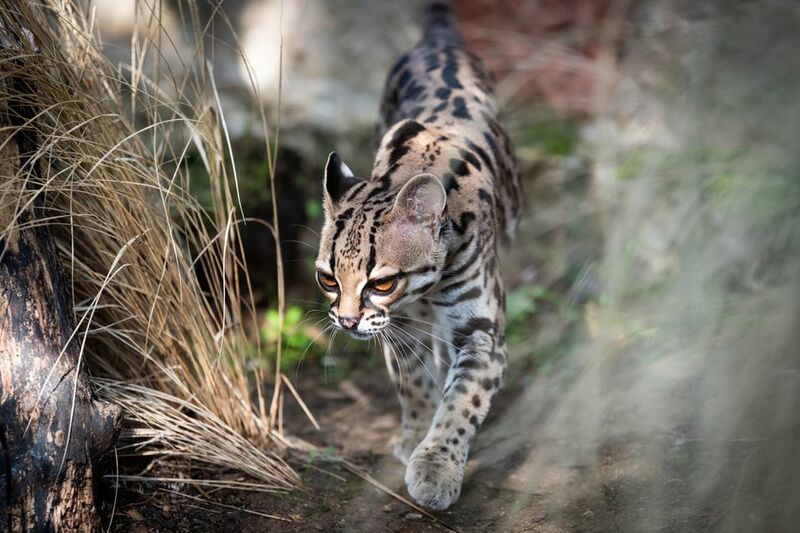 In the United States and Mexico, the danger of extinction lies in the encroachment of development upon the Ocelot's habitat (thick, brushy areas where they raise their young.) To some degree, the encroachment of human influence on habitats also plays a role in the decline of ocelot populations in rainforests and jungles. Two other factors in the 1960s led to the reduction in the population of ocelots that included the sale of ocelots as pets in the U.S. (which is fortunately now illegal) and the sale of ocelot pelts for fur. Although it is now illegal to engage in this trade, there is still an illegal market for Ocelot pelts. It takes 20 Ocelots to make a fur coat; do the math. The ocelot is basically a solitary animal, which hunts and roams its territorial range (around 20 square miles) alone. The male marks his territory with typically strong urine and is careful not to intrude into other male ocelots' territories. Ocelots' acute sight, sense of hearing and smell make them natural candidates as night predators. Although they are agile climbers and often kill and feed on monkeys, birds, and squirrels, they primarily hunt on the ground. On the ground, ocelots feed on reptiles, fish, rodents and rabbits, and young deer. Ocelots reach sexual maturity at about two years and mate once or twice a year thereafter. After a gestation period of approximately 70 days, a litter is born of one to four kittens, averaging two. The female ocelot is a dedicated mother, who only leaves her kittens in their secluded den to hunt. At around six months, the young ocelots start to hunt with their mother. Around 18 months, they leave to establish their own territories. Only by working together can we prevent the ocelot from going the way of the Cape Lion, and more recently, the Anatolian Leopard.